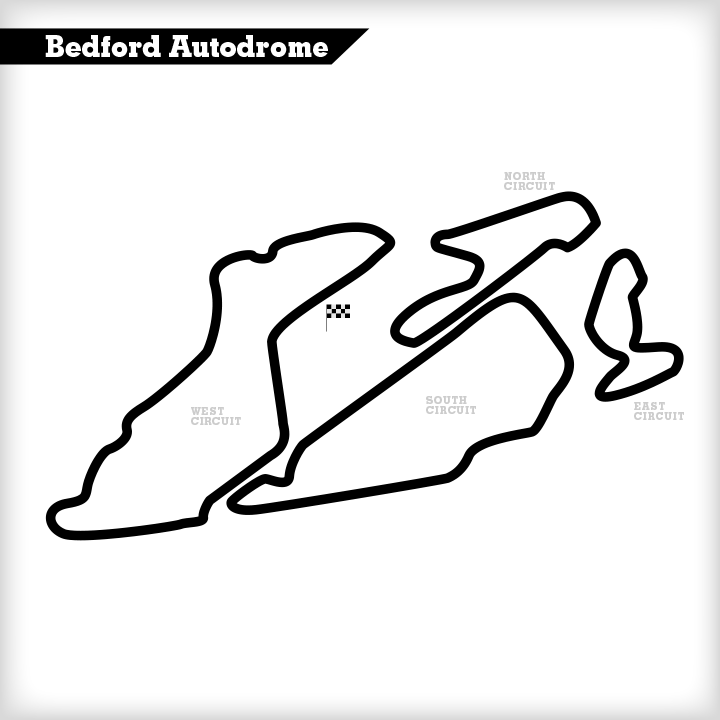 Bedford has multiple configurations, although there are four main circuits (used individually on corporate days) which are linked together to form the 3.6 mile GT (Gran Turismo) version, frequently used on track days. Facilities are first class, with two well-equipped hospitality areas in the pit lane in which to huddle away from the often chilly wind. The joint briefing room and restaurant is also excellent (if a little pricey). It is worth noting that Bedford has a very strict ‘no spectator’ policy and under 16s are not permitted as passengers, and therefore are not allowed on-site. You will usually run on the GT Circuit, but occasionally and in the evening the shorter South West configuration is used. Either way, the circuit is usually coned yellow turn in and orange apex. 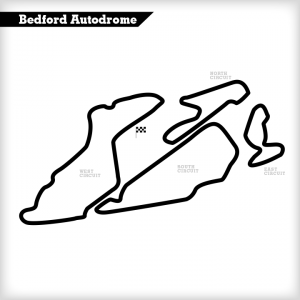 The full GT Circuit comprises 19 bends, and is a good mix of fast and slow corners, some technically challenging, plus several long straights, starting with West 1, which is the first corner after passing the main pits complex. The braking point for the Hairpinis in line with the pit lane exit road, ensuring you use the full width of the track on the exit of West 1. West 2 is nothing more than a flat left kink in the road. For West 3 and 4 that make up the chicane, using the kerb on the left side on the approach is a must, as is the kerb on the inside of the right, but do not use the kerb on the left-hand side of the exit as this one is very harsh and can pick the car up quite violently. West 5 and 6 follow and this is essentially a very fast left-right chicane where you should be building speed all the way through and using the full width of the track. On the run down to the Back Straight, bringing the car to the right-hand side of the circuit for the ultra-fast left kink of West 7, on the exit it is important to keep the car to the left and ensure that the wheels are straight. Then you brake hard for the tight right-hander that is West 8 where there is a white line painted on the road, which is used to guide the single seaters on the corporate days. Follow the line into the apex and then cross the line to use the full width of the track on the exit. It is important to be careful with the power application here as this is one of the places at Bedford where the Armco barrier isn’t far away. From the exit of West 8, this takes you onto the 1km straight that runs down to the South 1 and 2 Chicane – picking a braking point is key and you should use the countdown boards attached to the barrier on the right-hand side, adjusting your braking distance according to the stage or tune of your car. The chicane itself is straight forward, but be careful to not either turn in too early or start creeping into the middle of the road before the turn in, and remember to avoid the kerb on the left side of the chicane. The kerb on the right is flat and you should use about half of it. The next straight then takes you down to the East Hairpin, which is very open on entry but tightens on the exit, so be patient with the power. The next fast right-hander is straightforward, but be careful of the bump mid-corner. The following left-hander brings you back on to the North Circuit. The key is to use the kerb on the inside of the corner, carry the speed through and use the full width of the track on the exit to open up the second left-hander, again attacking the kerb on the apex. The hairpin on the North Circuit is the tightest corner of the lap, so ensure you scrub off enough speed before turning in, so you don’t understeer off the track on the exit. The next right-hander is a double apex with a nasty bump in the middle, so be careful as there is Armco to the inside. Then there is the run down theSouth Straight into the second-to-last corner. Brake at around the 125m mark – the corner is a very simple 90-degree right-hander. The final corner of the lap is West 13 and the key to this corner is to use the apex kerb on the inside and use the full width of the track on the exit, and if need be use the concrete that extends even further.